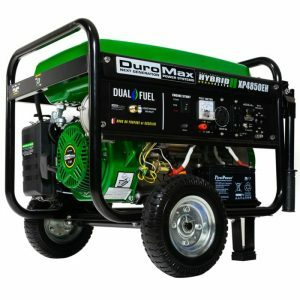 What Are Some of the Best Dual Fuel Generators that You Should Buy? What’s the Difference Between Single Fuel and Dual Fuel Generators? Why is a Dual Fuel Portable Generator Better? What are some of the disadvantages of these types of electric generators? Which type of fuel is more efficient? How can you choose the best dual fuel generator for your home and/or business? Is a dual fuel generator right for you? A buying guide for dual fuel generators will save you from the hassle of buying the most efficient and reliable electricity generator for your home and/or business. Since you already know some of the key features to consider when buying your dual fuel generator, now it’s time to review some of the best dual fuel generators in the market, that will provide efficient and reliable electrical power to your home and business premises. Westinghouse WGen7500 portable generator is incredibly powerful and also durable since it’s capable of producing up to 9.5kW of electrical power at peak. Its normal running watts is 7.5kW. With such an incredible electrical power, you will be able to power some of your heavy-duty electrical tools or appliances. For only $734.40, you could get this amazing workhorse from online stores such as Amazon. This portable generator also comes with a remote start, making you to start it without any hassle. This generator also comes when packed with other advantages such as low oil shutoff to prevent it from damaging; overload circuit protection; and a 3 year limited warranty which includes a lifetime support. The Westinghouse WGen 7500 is indeed a true powerhouse that’s also portable, thanks to its inbuilt extendable handles, and its rugged wheels that never go flat. You can read our full Westinghouse WH7500e Review here. What are the features of this amazing generator? This portable generator is powered by a 420cc 4 stoke OHV Westinghouse engine. The engine is equipped with a low oil shutdown technology to prevent your generator from damage in case of low oil level. The generator delivers an impeccable 9.5kW of power at its peak; and 7.5kW during running time. With this kind of electrical power range, this generator will start even your most demanding electrical tools and appliances. It also features a 6.6 gallons fuel tank, which has a fuel gauge. It comes with a remote start which has a key fob; electric style start; and a recoil style start. Two- GFCI 5-20R 120V duplex receptacle for your household electrical appliances. One- L14-30R 120V240V twist lock receptacle. All of these receptacles are covered by rubbers to prevent electrocution and short circuiting that might be caused by foreign objects. It’s ready for use right after you unbox it. It runs for up to 16 hours. The generator is very reliable since it produces large amount of electrical power that can run all your appliances. It’s CARB, EPA and CSA approved. It comes with a lifetime customer support. It has a 3 year limited warranty. The generator is heavy since it weighs 200 pounds. It a bit loud, producing 64 decibels of sound while in operation. The startup might be a little bit problematic. You could get this versatile, convenient and also powerful dual portable generator from online stores such as Amazon. And it’s versatile since you could run it on either gasoline or liquid propane. This generator features an easy to use electric start that lets you start it with a lot of ease even in the cold. What’s more, it has an ample 3.4 gallons fuel tank that will let you operate all your appliances for quite some time before a tank refill. When you want a safe and a long lasting power generator, you could count on this one. 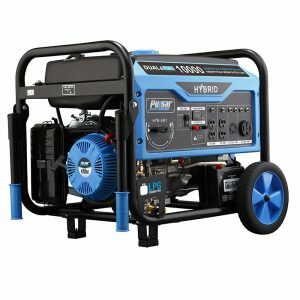 It has a low oil shutdown to make sure that it doesn’t damage when oil runs low; and it also has a volt guard surge protector that will protect all the loads connected to your generator. This generator uses a 224cc OHV 4 stroke, single cylinder Champion engine, which is also air-cooled. Runs on either gasoline or liquid propane. For gasoline, this generator delivers an incredible 4750 starting watts; and 3800 running watts. For liquid propane, it provides 4275 starting watts; and 3420 running watts. It has a 3.4 gallons fuel tank capacity. It also features a cold start technology, to help you power up your generator even in cold weather. It also comes packed with a volt guard surge protector, to protect your appliances especially the sensitive one. It produces 68 decibels of sound from 23 feet away. It’s capable of running for 9 hours on a full tank of gasoline, when you subject it to 50%load. – one- TT- 30R receptacle. – one- L5- 30R receptacle. – two- 5- 20R receptacles. It also comes with three function Intelligauge display. It’s EPA and CARB compliant is 50 states in USA. It’s easy to use since it comes with an electric style start. It’s durable since it has a one tubular frame to protect it. Also, it has a low oil shutdown. It’s affordable. Different online stores sell it at different prices, but it’s still affordable. It’s efficient and convenient. Also, it’s versatile since you have two fuel type options. It’s a heavy generator that weighs 132 pounds. It’s also loud, producing 68 decibels. It also has a low stellar review is some online. 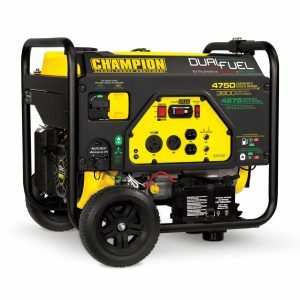 If you need a 7500W dual fuel generator for your home or even recreational vehicle, then the Champion 7500W dual fuel generator is your top choice. The generator is a cold start ability. This means that you can start it without any problem even if you live in an area with very low temperatures. With its electric push button that gets it started, you are bale to power your electrical appliances in just a matter of seconds. What’s more is, this generator comes with oil, making it ready for use the moment you unbox it. Its 439cc champion engine makes sure you have a consistent supply for electrical energy for 6-8 hours. 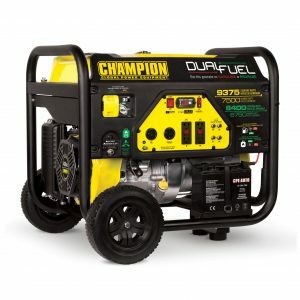 From $770.92, you can get this dual fuel generator from online stores, or other retail outlets. And since it’s dual, it runs on either liquid propane or gasoline. This ensures that you have two choices of fuels. When one becomes unavailable, you still have the chance to choose an alternative fuel. It also comes with an inbuilt surge protector that protects your appliances from high electric currents that could cause a damage. On a tank filled with gasoline, the generator runs for 8 hours on maximum load. And on liquid propane, this generator will power your home for 6hours at maximum load. Has intelliGauge to help you track its runtime and voltage. First, this dual fuel generator is CARB compliant. You can therefore buy it comfortably when you are in California. It has an inbuilt electric surge protector that will protect your electrical appliances from the spikes, in case there is any. And when you want to track the power output by this generator, it comes with a gauge to help you with the information you need. This gauge will also help you know when it’s time for a maintenance. Even though the warranty is limited to 3 years, you are still able to get a lifetime support. And lastly, this generator has an auto-shutoff for low oil level. The generator can be loud, at 74 Decibels from 23 feet away. Since it costs around $770 and above, it’s a bit expensive for most residential users. But all in all, it is a generator that is designed for practicability, reliability and easy to use. It will definitely supply you with the electrical power that your home or RV needs for full operation. Another excellent dual fuel generator is the Pulsar PG10000B16. With its 420cc 15HP OVH engine, it delivers 10kW of electrical power on gasoline at peak; and 9kW at peak on liquid propane fuel. But at 50% workload, you could run this generator for 12 hours! It also comes in handy with its switch and go technology that lets you switch from one fuel to another without shutting it down! It, therefore gives you convenience during operation. And to make sure that you can carry it around with you to wherever you go, it’s designed and fitted with collapsible handles, and plastic wheels. This adds more convenience to its usage. When you need to power your appliances with different power ratings and voltage, you have 4 receptacles options. This dual fuel electricity generator provides you with a versatile and efficient electrical power source. It’s also convenient since you can switch from gasoline to liquid propane, without switching off your generator. Convenience also comes in when you use gasoline when liquid propane becomes scarce, just as an example. And with its electric start, you can easily switch on this appliance, so that your home, business or even RV can have the electrical energy that you need. The only disadvantage that Pulsar PG10000B16 dual fuel generators have is higher prices. That’s all. Otherwise, they’re a great and reliable alternative source of electrical power. The price for this powerful dual fuel generator range from $999-$1049. It’s one of those versatile and convenient dual fuel generators that you can rely on for an efficient electrical power in case of a power outage. This generator runs on either gasoline or liquid propane. And when running on gasoline, it generates a peaking 12kW of electrical power, and a 9.5kW running watts. On the other hand, it produces a 10.8kW starting power and 8.55kW running power when you are running your generator on liquid propane. Apart from dual fuel capabilities, this pulsar G12KBN 12000W also comes with a protective durable frame, and a never flat pair of wheels to make it both durable and portable. With the kind of electrical power that it produces, this generator will power all your electrical appliances, even those which demand more starting watts like the air conditioners. This generator has dual capabilities. It can run on either gasoline or liquid propane. It also comes with a 457cc single cylinder 4 stroke OHV engine that’s air cooled. On gasoline, this generator produces 12kW starting power and 10.8kW running power. On propane, it produces 9.5kW starting power and 8.55kW running power. It has electric style start; and a recoil start. At 50%load, this generator runs for 12 hours. It has an 8 gallons fuel tank. Has a 10 inches wheels that never go flat; and a drop down handles for easy portability. This generator is versatile. You have the option to choose one of two fuel types: a gasoline or liquid propane. It’s also efficient, since it produces an amazing 12kW of power for 12 hours. It produces a clean electrical power. Some reviews suggest that the generator doesn’t arrive in a working condition. 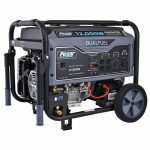 From just $569.84, you could get this dual fuel portable generator at online stores such as Amazon. 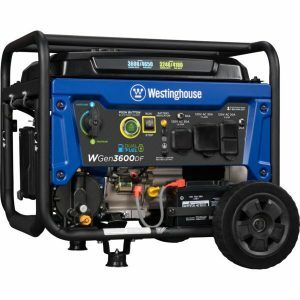 Westinghouse WGEN3600DF has dual fuel capability since it lets you use either gasoline or liquid propane thus, brings versatility in a very efficient way. With its 212cc 4 stroke Westinghouse OHV engine, this portable generator delivers an amazing starting watts of 4.65kW and 3.6kW running watts when you’re using gasoline. And it produces a peaking watts of 4.18kW and 3.24kW running watts when you use liquid propane. Therefore, this portable generator will power all your electronics efficiently and sufficiently. It also has low oil shutdown; and mufflers to reduce the sound it produces while running. Also, this portable generator has cast iron sleeves to offer protection, which will in turn offer durability. 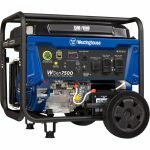 So, if you’re looking for a powerful dual fuel portable generator that’s capable of powering even your heavy-duty tools sufficiently and efficiently, then Westinghouse WGEN3600DF could be a great choice. It engine capacity is 212cc. It uses a 4 stroke OHV Westinghouse engine to provide you with an efficient electrical power. This generator is EPA, CARB and CSA compliant. Plus, it comes with a 3 year limited warranty and customer support services. On gasoline, this generator peaks at 4650W and runs at 3600W. On propane, it starts at 4180W and runs at 3240W. One- 5-20R 120V Duplex outlet. An RV-ready TT-30 30A outlet. It has automatic low oil shutdown. It also comes with a long lasting cast iron sleeves that protects its engine. It’s a plug and play generator that comes with oil, oil funnel, tool-kit, and user manual. It has a very minimal assembly since you’ll only install the wheels and hook the battery. It’s easy to start since it offers you a wireless remote start; an electric start; and a pull start. It has a long running time. On a 4 gallons of gasoline, this generator will run for 18 hours at 25%load; and 20hours on propane when it’s at 25% workload. It comes with a circuit breaker to prevent you from overloading it, hence increasing its durability and efficiency. It’s heavy, weighing 109 lbs. but it’s still portable, thanks to its never flat pair of wheels. Not reliable in quality control. This is a dual fuel generator that runs on either liquid propane or gasoline. You can run this generator using either of the two fuel types already mentioned herein. The Duromax XP12000EH is, thus, versatile and will help your electrical needs adapt to the available fuel type. Besides being versatile, this dual fuel generator is portable, thanks to its rugged wheels, heavy duty frame, and easy-to-use collapsible handles. You will, therefore, move this generator around with a lot of ease! Duromax XP12000EH dual generator is also efficient since it is capable of generating sufficient electrical power for 20 hours when running on liquid propane fuel, at 50% load; and 10 hours on gasoline when also at 50% workload. It will therefore power all your home’s electrical appliances efficiently. Moreover, this generator comes with 4 different receptacles to allow you to plug in your electrical appliances that have different power voltage and current requirements. With all the four different types of receptacles, all your electrical devices are powered with sufficient electrical power. This generator has the 457cc Duromax OHV engine that converts the energy in either propane or gasoline into a 12kW electrical energy. At 50% load, you can power your electrical appliances for 20 hours on liquid propane; and 10 hours on gasoline. The generator also has an 8.3 gallons fuel tank that will hold your fuel for a long time before a refill. This capacity translates to 31.4 liters fuel tank capacity. The sound level is 72 decibels from 23 feet away. 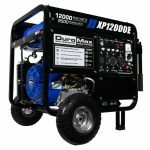 Duromax XP12000EH is a versatile generator since it lets you adapt to the fuel that is readily available and/or affordable. Also, the generator has dual fuel capabilities since you could use either liquid propane or gasoline to run it. Besides all these pros, this generator is portable, thanks to the rugged wheels and collapsible handles. And lastly, this generator has a low oil shutoff. Despite having advantages, Duromax XP12000EH has one major setback. It has a limited warranty. That’s it! Otherwise, it’s a great dual fuel generator that will provide you with a reliable and efficient electrical power. Duromax XP4850EH is a dual fuel portable generator that’s designed to provide a safe and convenient electrical power. It’s easy to start since it comes with an electrical start style, which is as easy as starting your car. It also features a recoil start, just in case your generator’s battery drains. It provides you with a sufficient and convenient electrical power from two fuel types: gasoline and propane. With its 210cc 7HP OHV DuroMax engine, it will provide you with a 3.85kW of electrical power that can surge up to 4.85kW, to start even your most demanding electrical appliances and/or tools. You will be able to power even the air conditioner inside your RV. This generator also has leverage handles and solid tires that never go flat. You will, therefore, be able to carry it to wherever you go so that you can have a clean electric power source. The generator comes with mufflers and in-built spark arrestor. This generator uses a powerful 210 cc 7horsepower air cooled OHV DuroMax engine. It has electric and recoil start. On gasoline, it runs for approximately 8 hours when it’s at 50%workload. Also, it runs for approximately 9 hours 30minutes when you’re using liquid propane, at the same workload. It has two standard receptacles which deliver 120V 20A to your electrical appliances. It also has one 120V/240V 30A twist lock receptacle. It comes with one 12V 10A utility connection. It produces 69 decibels of sound. It has dual fuel capabilities. It lets you choose either gasoline or propane to power up your home. It comes with a wheel kit and folding handles, thus very portable. It has a low oil shutdown to protect your valuable generator. It has a super quiet muffler that reduces sound level. It lets you charge your car’s battery since it has a 12v outlet. Provides sufficient and efficient electrical power. It’s quite a challenge to fill the engine oil. Its 12V outlet might provider higher voltage which might not be suitable for your 12V appliances. The WEN DF1100 dual fuel generator lets you power up your home from two fuel types. You can choose either gasoline or propane to power your dual fuel generator. What’s more, this generator has an electric style start, thereby easing your work when you want to get things powered up. Whether you’re powering up your electrical appliances during a major power blackout or during a camping detour, this efficient rv generator has you covered. With its 457cc air cooled OHV engine, this generator produces an incredible 8.3kW that can surge up to 11kW on gasoline fuel. Propane fuel on the other hand, produces 7.5kW that can surge up to 9.5kW during starting time. With such an incredible electrical power, even your most highly rated electrical tools and appliances will get powered sufficiently. The generator also comes with wheels and handle kit, which improves its portability. It has a 457cc air cooled overhead valve engine. It has electric start system. Its fuel tank capacity is 6.6 gallons. It also comes with a digital LED hour counter. Also has automatic voltage regulator. Comes with a bottle of oil, a 47 inch LPG hosepipe. It’s versatile since it has a dual fuel capability. It’s reliable and efficient, especially during a major power outage. Has an electric start style. It has a limited warranty. It has a low stellar review. 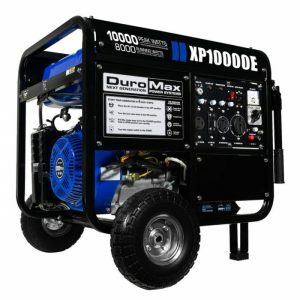 The DuroMx XP10000EH features one of the best 18HP engine that produces an enormous 8kW of electrical power and can peak at 10kW during the starting time. Whether you want to power your campsite or home, DuroMax XP10000EH dual fuel generator will provide you with the power that you need. It also has dual fuel capabilities. You could use either gasoline or propane to generate the power that you need during a major power outage. It comes with one of the best power panel. In its power panel, it features a RV switch; idle control; and keyed electric start. It also has a volt meter that helps you track the amount of volts generated by your generator. And to make sure that your electric appliances are powered safely, this portable generator has a circuit breaker to prevent overload. This generator is very efficient since it has the auto throttle technology that adjusts the engine speed to produce only the needed power. If you have a light load, this generator will not run at full speed, thus saving fuel. It has a fuel tank capacity of 8.3 gallons. Its engine displacement or engine size is 439cc. At 50%load, it runs for 10hours on gasoline; and 20hours on propane. It has a low oil shutdown. Has auto throttle tech to minimize fuel consumption when your load is lightweight. It also has built-in spark arrestor. It also has a muffler that reduces the running sound. This generator has electric style start and a recoil start. It generates both 120V and 240V AC power; and 12V DC power. It also produces 66.5A/33.3A. It has an 18horsepower engine. It produces 72 decibels of sound. It’s a reliable power source since it produces 10000W at peak, and 8000W during running time. It’s easy to start, with its electric style start. It has dual fuel capability, hence it’s versatile. It’s smooth and quiet. It has in-built mufflers to help minimize the sound. It has an automatic low oil shutdown. When you’re using propane, this generator becomes eco-friendly. It’s efficient since it has auto throttle technology. It could be intimidating to operate this generator, especially to novice users. Some buyers complain that that the battery is dead. You need a heavy constructing to handle this kind of a generator. Getting electrical power for your home isn’t much of a challenging today, since there are a range of portable generators that you could use for your home and/or business. With today’s more advanced technology, there are versatile and portable generators that prove to be more efficient for your home, especially for homes located in remote areas that might not have electric connectivity. These generators perform excellently and efficiently, making them very reliable for lighting, as well as heating homes. This means that you could light up and heat up your home using these generators that produce enough watt for all your home’s electrical needs. Basically, there are three types of portable electric generators: the single fuel generators; dual fuel or bi-fuel generators; and the tri-fuel generators. When buying whole house generator, you need a buying guide that will help you buy the right generator that will power all your electrical appliances and home systems such as lighting and HVAC system. But first, there is the need to know all the three different types of portable generators. First, there are four main fuels used to operate or run portable electric generators. These fuels include: gasoline; diesel; liquid propane (LP); and natural gas (NG). Now, a single fuel generator use only one of the fuels mentioned above. Most single fuel generators run on either gasoline or diesel. For example, single fuel generator that use diesel will use only that fuel type, and not any other type. The same way, a gasoline single fuel generator will only use gasoline, and not any other fuel type. In other words, you only have one choice of fuel when you buy a single fuel generator. On the other hand, a dual fuel generator runs on two fuels types. With dual fuel generators, you can use an alternative fuel when the one that you normally use becomes scarce. For example, a dual fuel generator that runs on liquid propane gives you the chance to choose gasoline when liquid propane becomes scarce or more expensive. A tri-fuel generators use any one of three fuel types. For example, you could run them on liquid propane, gasoline or natural gas. Portable generators have indications of the fuel type(s) that you could use. This is a very vital and critical information that you will know. Multi fueled electric generators such as dual fuel generators have advantages over their single fuel counterparts. So, what are some of the benefits of using these types of electric generators? First, dual fuel generators are versatile and efficient. Since they use two fuels to generate electricity, you have the chance to use a cheap alternative fuel source in case the fuel type that you normally use either becomes more expensive or scarce for any reason. Also, dual fuel generators are efficient at providing stable electric power that can power all your home’s electrical appliances and home systems for longer time. Most dual fuel generators operate on either liquid propane or natural gas. In case the propane or the gas is unavailable for some reason, you will still use the other fuel type, as an alternative fuel source. Secondly, dual fuel generators offers you longevity in terms of electric power supply. Since dual fuel generators have two fuel storage units or tanks, you could operate your generator on one fuel, and automatically switch to the other type of fuel when the first fuel runs out. Your generator will switch to the other available fuel, thus serving you longer than a single fuel generator would. Dual fuel generators also lets you switch between fuels during operations, thus providing you with convenience. For example, you could start your dual fuel generators on gasoline, and then switch to liquid propane later. This is an advantage that will help you utilize a fuel type that operates best under some weather conditions but don’t in others. The versatility of these kinds of generators will set you ahead of your business competitors who might have single fuel electric generators. When one fuel type becomes scarce because of some adverse weather conditions, you still have an alternative solution to your homes or even business’ electrical power needs. Therefore, if you want reliability, versatility and efficiency as far as fuel generated electricity is concerned, then dual fuel generators are one of your best electrical power solutions. Even though dual fuel electric generators have profound benefits as far as electrical power supply in areas cut off from the national grid are concerned, they have a few drawbacks. First, these types of generators are more expensive than their single fuel generators counterparts. And for this, reason you will have to plan and budget for you to buy the best dual fuel generator. For example, a dual fuel generator of the same size as the single fuel generator will cost more. Also, finding the best dual fuel generator could prove to be a nerve-wrecking search since there are so many types of dual fuel electric generators that are specialized and designed differently depending on various needs. And for this reason, you will need a very detailed buying guide to help you in your search for the best and most efficient dual fuel electric generator. 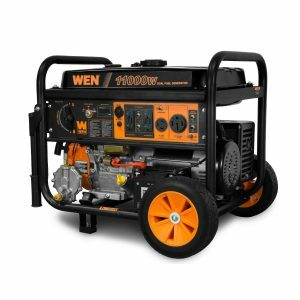 Therefore, for you to buy one of these efficient and excellent portable generators, you will need to plan well and budget so that you a reliable and efficient alternative electrical power source. There are four main fuel types that could be used to power electric generators. These fuel types include: gasoline; liquid propane; diesel; and natural gas. These fuels have their pros and cons. Gasoline is the number one choice of most generator users. It’s readily available and also very affordable. However, this fuel has some drawbacks that make it unsuitable for use under certain weather conditions and/or beyond specific times. For example, gasoline is highly inflammable and isn’t ideal for use under very low temperatures. Also, it has a short shelf lie. This means that you can’t store it beyond a period of, say, 1 year for later use. If you don’t use fresh gasoline, the carburetor of your dual fuel generator might clog and emit very hazardous effluents. You should, therefore, keep the gasoline fresh and keep your carburetor under checks and maintenance. When you want higher watts of electrical power, then dual fuel generators that use diesel as one of their fuels is your solution. Diesel is a fuel that has high fuel efficiency. If your business needs 150kW of electricity or more, then you will buy a generator that operates on diesel as its fuel source. Also, diesel are less inflammable as compared to gasoline fuels. And for this reason, you could use them in areas with cold temperatures. Diesels have shelf life of 1-2 years. Also, you could use them together with fuel additives, under frigid temperatures. Liquid propane has indefinite shelf life. This means that you could leave the propane fuel inside your dual fuel generator for years and use it without any problem. Your generator will start without problems. Also, propane doesn’t clog the carburetor of your dual fuel generator. Generators which use propane are also ecofriendly since they are silent. Enough with the praises. Propane fuels are more expensive than gasoline. Also, the installation and maintenance of generators that use propane is very complex and expensive. Also, these generators have shorter lifespan, and higher fuel consumption as compared to both gasoline and diesel dual fuel generators. You probably are already using natural gas for cooking and heating your home. This gas could also be used to power up generators. This fuel type is beneficial since it’s easily obtainable and could operate even under frigid temperatures without any problems. Generators that use natural gas have higher engine life. This means that these kinds of generators will serve you for a long time. However, natural gas-powered dual generators have higher fuel consumption. Also, the supply of natural gas might be limited during adverse weather conditions or disasters such as earthquakes due to wreckage of gas pipes. Depending on where you come from, you could choose the ideal fuel for your electric generator. If your home electrical appliances use AC power output, then you could buy a dual fuel generator that produces AC electrical power, or has sine wave power. Also, make sure that the generator that you are buying provides sufficient electrical power for all your appliances. Depending on your preferred fuel type, you could buy a dual fuel generator that operates for as long as 40 hours. Diesel dual fuel generators run longer than gasoline and even liquid propane generators. So, when you have a business that might need high watts of electrical energy for longer time, then diesel dual fuel generators are a good solution for you. Dual fuel generators have running times specified for each make and model. Just choose the one that provides enough power, for enough time. Your dual fuel generator professional will help you out. Dual fuel generators cost from few hundreds of dollars to several thousands of dollars. After knowing your electrical needs, you could buy a portable generator that supplies you with the electrical energy that your business or home needs. A higher price will often get you a good dual fuel generator. You should, however, know that dual fuel generators cost higher than their single fuel generators sisters. So, make sure your plan is in a good budget. People’s electrical needs are dictated by their lifestyles. Businessmen and women might need generators that provide higher watts that can power all the electrical appliances and systems in their business centers. People living in residential building might need lower electrical watts, just for home use. Depending on your electrical energy use, you could buy either a higher watts or lower watts dual fuel generators. On our website we have generator wattage calculator that can help you to make right choice. Also, consider the size of the generator for easy mobility. Is it easily movable? There are different models and types of dual fuel generators. Choices will be based on electrical power output and portability. But it’s advisable to buy a generator that you could move with easily. This way, you will be able to carry your dual fuel generator with you to your premises which have been cut off from the national grid by either a storm or lightning. Make sure to buy a dual fuel generator that is safe to operate. Make sure you read all the safety rules. Gasoline generators should be kept away from places with higher temperatures or heat source since gasoline is highly flammable or inflammable, and their vapor are emitted even under room temperatures. Diesel on the other hand, are less flammable and less volatile. Make sure you keep your fuels under the recommended storage conditions to avoid any hazardous risks. Follow the safety concerns when buying dual fuel generators. When buying a dual fuel generator, make sure that they are approved and certified by the relevant government agencies. For example, when you are in U.S, check whether they are approved by EPA and CARB. This will help you buy a genuine product that you could use in your neighborhood without landing in any trouble with the law. Before buying a dual fuel generator, consider how far or near is your generator’s fuel source? If your areas has affordable and readily available gasoline, you could proceed to buy a generator that use gasoline as one of its fuels. But when gasoline is not readily available because of natural disasters that causes breakage of transportation pipelines, you could switch to another dual fuel generator. Also to take into consideration is your area’s local weather conditions. Different fuels are affected by weather differently. For example, gasoline don’t power generators well under very cold weather conditions. For this reason, you will require a different type of dual fuel generator that uses another fuel, say diesel, which could run in frigid weather conditions. Different dual fuel generators operate under different temperatures. Some can handle the cold outdoor weather, while some can’t. For all these reasons, take into consideration that weather under which you will want to operate your dual fuel generator. Noise is one of the environmental pollution. You should keep it quiet in the neighborhood even when you go about your daily business. One of the ways that you could use to make sure that you keep it quiet is buying a quiet generator. Liquid propane-powered dual fuel generators are generally quieter compared to gasoline generators. Also, these kinds of generators run on clean-burning energy. They, therefore, don’t emit s lot of dangerous fumes in to the air. You could therefore buy liquid propane dual fuel generators if you want quietness in your home property and/or business. When choosing a dual fuel generator, look for one with an intuitive and easy-to-use control panel. This will help you operate your power-generating appliance with lot of ease. Also, the control panel should have indicator lights on it; oil and fuel gauge to help you monitor their levels; and fuel meter. Also, look for a portable generator with a 120 volts receptacle if you intend to use it to power your home’s electrical appliances. But if you are buying your generator for business use, you could go for a dual fuel generator with a 240 volts receptacle or power outlet. And for recreational use, you could need a 12 volts DC power outlet, for your vehicle’s battery. When you live in an area that frequently experiences power outage, our top picks of portable generators will help you in ways that you will be thankful for. And when you want to go for camper outings, these kinds of generators will help you. They are portable, meaning you can carry them with you to almost everywhere you go. These generators will help you prepare for emergencies caused by disasters such as storm, which may cause a blackout in your area. When using these kinds of generators for your home’s electrical emergencies, you will have to manually switch them on during a power outage. There are two ways of switching them on. One is by turning on the electric start switch, or pulling a recoil starter. When faced with power outage problem, you will be glad you have a dual fuel generator.